Check out the Christmas market in Strasbourg, France, and then visit the new microbrasserie Bendorf. Photo courtesy @CRTA-Zvardon. ‘Tis the season for folks named Old St. Nick, Rudolph, Frosty and Jack Frost. Contrary to what some people say about Christmas being a way bigger event in America than it is in Europe—and while it’s true that you don’t see nearly as much commercialism splattered in each store aisle, painted on all shop windows or pouring out in carol form from every radio—Europeans manage to cram all that holiday spirit into condensed outdoor Christmas markets. Yes, outdoors! That’s what all the glühwein is for. It’s possible to find the occasional hot, spiced beer or cider, too, but save the beer for the way brewers intended it: chilled in your glass but warming on the inside. Such festive marketplaces are found across the Eurozone, but here are some top ones in beer destinations. A word of warning about European service: You’ll sooner get that Red Ryder carbine action air rifle you’ve been dying for than a waiter to take your order or deliver your check, and that’s when the bar’s empty. More than 400 miles from Strasburg, Germany, this one’s just 3 miles across the German border in the Alsace region. Famed as the home of the first and hence longest-running Christmas market, dating to 1570, it was coined Christkindelsmärik, or “market of the infant Jesus.” Bursting with treats for young and old, including an ice skating rink, rides for the kinders, bredele (Alsatian Christmas cookies with festive shapes and ingredients) alongside roasted nut and confectionery vendors all centered on a massive tannenbaum, it’d be easy to never leave the market’s lights and sights, but Strasbourg is that rare French town with an abundant brewing culture (credit the neighbors over the Rhine). The Christmas market is held in the Place Broglie near the adorable neighborhood of Le Petite France. The homes and buildings already look like life-sized gingerbread houses, and the neighborhood is lined with cobblestone streets. Contrast the history by visiting the brand new microbrasserie Bendorf (114 rue Jean Jaures) in the Neudorf neighborhood on the Rhine River. Sous La Neige is its take on the Alsatian Christmas beer, traditionally brewed by monks, and it’s a malt-forward amber ale brewed with orange peel and coriander, creating notes of sweet, dried fruits like those often found in bredele. If that’s not your stocking stuffer, Bendorf also makes Queen of Langstross, a houblon-forward IPA! Another new, jet-setting brewery is Biere Perle, aka Bieres Artisanales Artzner, (12, rue Aubry and Rau) since it’s been reanimated by Christian Artzner, the great-great grandson of Peter Hoeffel, who founded it in 1882. For starters, Noel is the must-try during the season, a nearly 7% stout spiced with vanilla, ginger, currants, orange peel and caraway yet with none dominating the palate. Marrying beer and wine, Dans les Vignes is a copper ale that tops 7%, and the local Riesling grapes make it quite “fruit forward” for fans of both beverages. Lastly, Démenthe takes a white beer base and adds fresh mint among other herbs for a beer that not only pairs with dessert, but also lighter fare such as salads. 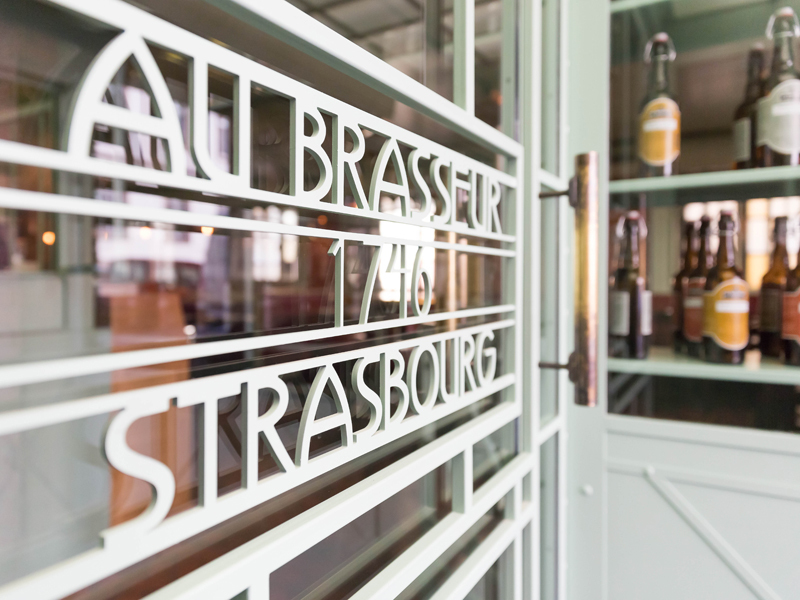 Au Brasseur in Strasbourg dates back to 1746. For more from the what’s old is new again, Au Brasseur (22 rue des Veaux) dates back to 1746, but instead of being over 200 years old, it’s really over 20 years old, having been reincarnated in 1991. Noel is a 6.6% winter warmer, and while you won’t find vintages of it in the cellar, that is where you’ll find live music, often jazz, on weekends. If eating here, the specialty is flambée—think pizza baked on oblong tortillas—which is quite the regional dish. Brasserie de la Lanterne (5, rue de la Lanterne) is a popular nightspot that happens to brew its own to serve to patrons who gather to listen to musicians who plug in in the corner. Although the Biere Blonde is the go-to here, a light-colored and medium-bodied ale with sweet Belgian yeast (and possibly sugar), Christkindel is a light holiday beer brewed with cinnamon that presents itself at first sniff. For the largest selection of Alsatian beers, and beyond, Village de la Bière (22, rue des Frères) is a bottle shop with helpful staff where you’ll find La Fouettarde from Matten (Matten.fr), a Christmas beer like few others around here since it’s billed as a Black IPA deriving its warming malt body and unique holiday cheer not from a bag of mulling spices but from steeping massive sacks of various hops. For beer lovers, Belgium is Christmas year-round. From rare, spontaneously fermented lambics to ultra-rare Westvleteren, the Trappist ale renowned by being difficult to obtain, many a beer café’s menu reads like your wish list to Santa. As for the Christmas market that runs from late November to early January, I can’t speak from experience, but I’ve been during Belgian Beer Weekend held in September, and it takes place in the same town center, Grand Place, where dozens of beer elves (I guess they’d be gnomes here) were hard at work making branded, proprietary-shaped glasses filled up for all the boys and girls of legal age (18). The holiday market spills out to the Place de la Monnaie, Place Sainte-Catherine and the fish market, filling the snow-laced winter wonderland with an ice skating rink, carousel, ferris wheel and more tasty treats and handmade gifts offered from little chalets than you can shake your chalice at. Moeder Lambic is a must-hit bar in Brussels. 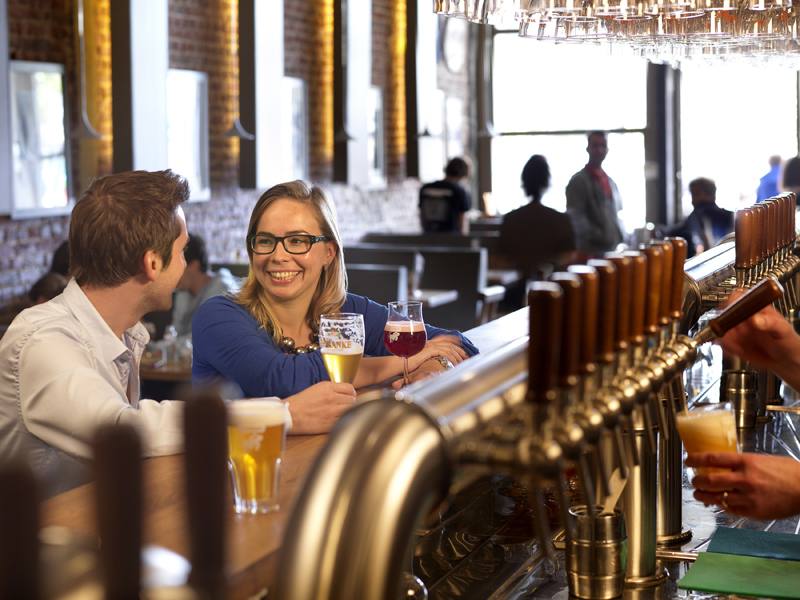 Among the beer destinations surrounding the Grand Place, a must-hit bar is Moeder Lambic (8 place Fontainas), the more central of its two locations. There are 46 beers on tap, such as exclusive beers from Brasserie de la Senne (BrasseriedelaSenne.be/EN/)—and yes, those half-dozen Cantillon lambics are on cask—and three times as many bottled beers from throughout Belgium and the world, none of which you’d turn Frosty’s button nose up at. The most famous landmark in Belgium, it’s been said and ridiculed, is called Manneken Pis, a water fountain of a little boy peeing into a little pool. When you see it, that’s how you know you’ve arrived at Poechenellekelder (Rue du Chêne, 5). This rather cool beer hall with strangely fun décor of marionettes, dried hops, breweriana and the errant tuba hanging from the ceiling offers a deep but manageable beer menu with the expected range of abbey ales, Belgian golden, dark, or strong beers, and sour lambics. It’s a great place to get your St. Bernardus Christmas Ale on, and once the 10% alcohol of this prune and treaclelike quadrupel kicks in, the marionettes inside or the famous mannequin outside may put on a show. Less than a half mile away, Manneken’s counterpart, Jeanneke Pis, can be found outside the most notorious sudsy destination, Delirium Café (Impasse de la Fidélité 4a), sporting the longest bottled beer list, according to the Guinness Book of World Records. It looks like a mid-sized city’s telephone book. If your first or second choices on the mercurial list aren’t in stock, surely one of the other 2,400 offerings will do the trick, including pages worth of vintage bottles such as De Struise’s Pannepot Reserva from, well, pick a year. Go early or at least head up or down stairs to avoid those acting naughty, turning it into the Cabo Wabo of partiers unfit for reflective enjoyment. These bars do serve small sandwiches and snacks, but to fully soak up these delicious libations while adding to them as well, walk over to Nuet Nigenough (rue du Lombard 25. Note: no reservations), which means the Greedy Glutton. That means the beef stew is made with Rochefort (though I suggest accompanying it with De Dochter van de Korenaar’s Charbon, a dry, smoky stout), the black pudding (blood sausage) with Orval, and the oh-so-tender rabbit is prepared in a gueuze sauce, so go ahead and order a bottle of Cantillon Grand Cru Bruocsella to pair it with. Since that’s two mentions of Cantillon (Rue Gheude 56) beers, perhaps saving the best for last, Brussels is home to the venerable lambic producer whose brewing techniques have remained virtually unchanged since its founding in 1900. And since it’s all about letting nature be nature—they don’t inoculate the wort with any yeast or bacteria—the cobwebs over the barrels and cellar attest to the laissez-faire approach. Offered every day but Sunday, the seven-Euro tour includes two tastings, and you’ll be able to buy bottles—including gems like 2012 rhubarb Zwanze and apricot-laden Fou’ Foune to enjoy in the tasting room and the take-away bottles come at a comparative steal if you’ve ever even found a bottle on American shelves. ’t Brugs Beertje in Bruges is one of the world’s top beer bars. Flickr photo via TravelingOtter. Any wintry trip to Belgium should really include both Brussels and Bruges, since they’re an hour apart by high-speed train. Even the other 11 months of the year, the medieval architecture is stunningly beautiful and the lights, both on and off the towering Christmas tree in the main square, will keep your social media photo stream more about the scenery than the beers you’re drinking. 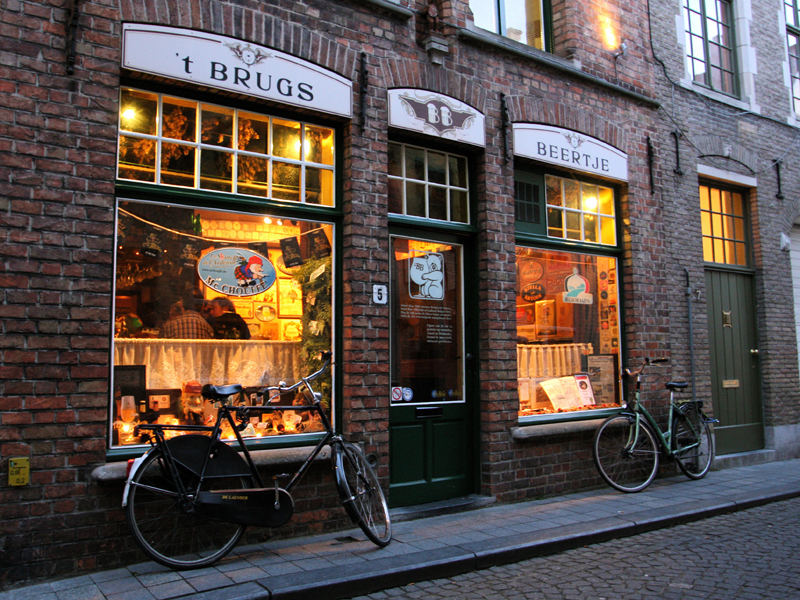 Nearest the Christmas market is one of the world’s top beer bars, ’t Brugs Beertje (Kemelstraat 5). Once you find it down the narrow alley, if the front room appears too packed (it will be), head through the back door to the next, larger room. Leaf through the multi-page beer list, but a bottle of Corsendonk Christmas and Scaldis Noel surely fit the bill. You’ll discover ample kriek lambics such as Boon Kriek Mariage Parfait. Back outside among the vendor chalets, go nuts and try the glühkriek, warm and spiced cherry beer. A gorgeous 15-minute stroll (don’t rush it; make it 20) and you’re at De Kelk (Langestraat 69) and since it’s off the main square, there will be some locals inside. Trappist ales and gueuzes abound, but given the proximity to De Struise (Struise.com), seek out virtually any of the bottles from the Black Damnation series, which uses the already crazy-good Black Albert imperial stout and then sees treatments entailing barrel aging, peaches, coffee beans and more. For dining purposes, a repast at Bierbrasserie Cambrinus (Philipstockstraat 19) yields hearty options for the season, many cooked with beer. A bowl of the rich vlaamse stoof, Flemish beef stew, prepared with Gulden Draak, a tripel ale, always hits the spot, and of course a steaming pot of moules frites (mussels and fries) is a classic. Order the Trappist made cheeses either as a starter or for dessert. Then again, this being Belgium, no reason to not pop into a chocolatier afterward. Chocolate shops abound, but I recommend The Chocolate Line (Simon Stevinplein 19) for its creative infusions from teas to cola to one claiming to be weed. Unlike chillier locations in Northern Europe, those who’d prefer not to have a white Christmas can head to Barcelona on the Mediterranean Sea, capital of the Catalonia region. It hosts two Christmas markets about 2 miles apart: Fira de Santa Llúcia outside the gothic La Seu Cathedral (at Plaça de la Seu) and Fira de Nadal outside the modernist la Sagrada Família. Legendary Catalan architect Antoni Gaudí’s cathedral is simply the most spectacular one I’ve ever entered. For many beer lovers, color is something we only think of in terms of Standard Reference Method (SRM), the system that brewers use to measure how light or dark their brews are. But the spacious Sagrada Família (nearing the tail end of its 150-year construction period) is more futuristic than it is historic, and the rainbow-trouncing stained glass panels throughout are largely to credit. As for the golden, amber and mahogany hues, the top beer destination is BierCaB (Muntaner 55), which local beer blogger Joan Villar-i-Martí of Birraire.com guided me to. In this cozy bar you’ll find some 200 bottles (including vintages) and 30 rotating taps (though expect only a few from Spain) served under a canopy of what looks like exploding wooden pallets. With Belgium, England, Scandinavia and even Italy represented among the curated handles, you’ll likely find something delectable from “client” Spanish brewers Guinea Pigs! like the IPAporter. It’s not a black IPA or an imperial porter, but it is amazing. Best of all, it goes with BierCaB’s unique tapas, such as, get this, grilled Wagyu with chimichurri sauce made of hops. Another small, cozy spot is Ale&Hop (Carrer de les Basses de Sant Pere 10), a burrow (not un burro), a 10-tap haven for hopheads who generally must spill out onto the sidewalk (but leave their glasses on the window ledge). One can find experimental hoppy beers from Edge Brewing, a local brewery started by a pair of Americans. Also look for bottles from client/contract brewery Nómada, such as its muy popular Papaya Crash, a double IPA with more than a hint of papayas. Speaking of fresh fruit, don’t miss La Boqueria (Plaça de la Boqueria). More than a food market, it’s a food temple. This seemingly unending marketplace is home to colorful arrays of fruits and juices, unbelievable hams, seafood, candies and more, including tiny tapas bars. For a high-end meal, Villar-i-Martí suggested El Racó d’en Cesc (Carrer de la Diputació, 201) “with spectacular Catalan food and a wide selection of bottles. It also has a special menu with beer pairings for every course,” he added. Recently, that menu included tuna tataki with polenta, basil and pistachio oil served with Abbaye des Rocs’ imperial witbier, Blanche des Honnelles, and that was just the starter. It also does a gourmet version of the popular local dessert, crema catalane, which gives crème brûlèe a run for its Euros. Having said that, there’s a great churreria—yes, a place that just makes churros—called Xurreria Trebol (Corsega 341) that’s open late, as is the brewpub around the corner, La Cervesera Artesana (Sant Agustí, 14). The stout leans toward the dry Irish style, but it’d still go great with a chocolate-filled churro, which beats the pantalones off roasted chestnuts any day. No mention of Bamberg and Nürnberg, especially in a beer-themed article like this? Really? Agree with Christian in an earlier comment. We send to Dusseldorf for these exact reasons of visiting the Christmas Markets and the near locations of the Altbier pubs. A fantastic experience and we also made a side trip to Koln. Both areas deserved high mention in this articled. Don’t Forget Liège in Belgium !